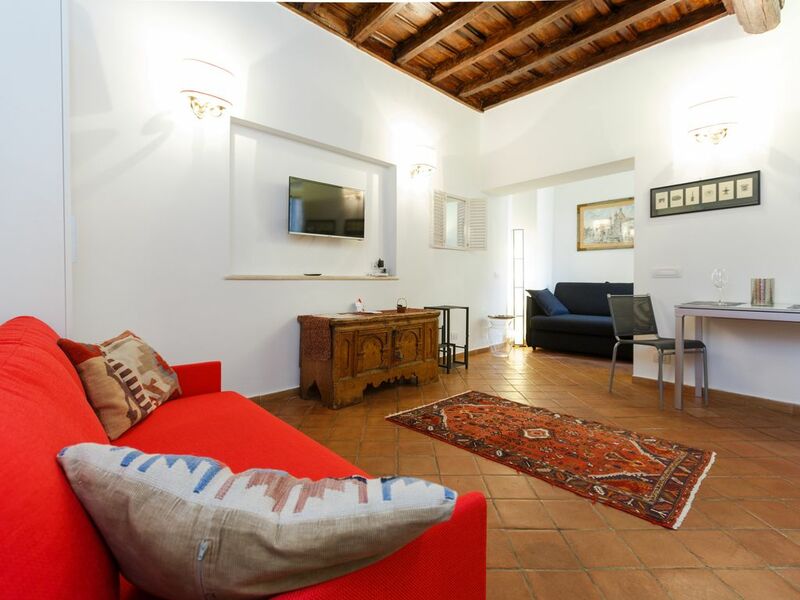 Lovely open space apartment in a neighborhood unique: halfway between Piazza Navona and Castel Sant'Angelo, a few steps away from the famous street of the Coronary worldwide antique stores! Across the river, the Ponte Sant'Angelo (pedestrian), you can easily reach St. Peter's Square or you can even take a boat ride along the river: a unique experience! The apartment (35 square meters) can accommodate 2 or 4 people. the ceilings are coffered and the original terracotta floor. One of the two beds during the day literally disappears, the other is a sofa bed. The kitchen is fully equipped with 2 electric hobs ceramic, dishwasher, fridge / freezer, toaster, microwave. Electric heated towel rail in the bathroom, washer-dryer, hair dryer, shampoo / shower, body cream, hat, slippers. Complete the apartment with a flat-screen TV, WiFi, safe, A / C It comes everything you need for the first breakfast and coffee in capsules. Bed linen and towels provided. Final cleaning € 35 payable on arrival. The building has no lift but there are only 37 steps to get to the plane which is the second and last. From Termini station you take a bus, the 40 Express for 6 stops. From Fiumicino airport, the shuttle bus arrives at Piazza Cavour (behind Castel Sant'Angelo) and is easily accessed on foot to the apartment. Salle d'eau avec machine à laver / dryer. I've stayed in this apartment with my mother for 5 nights. It is centrally located clean, very quiet,well maintained lovely studio. It has everything a traveler needs-wifi, city map, washer/dryer, nice compact kitchen with a dishwasher, two sofa beds... The owner-Paola was very friendly, helpful and accommodating.She has sent us instructions by email how to get to the apartment by public transportation and taxi prices (which was essential because we could overpay 20-25 euros if we didn't know the taxi rates). She stocked up the refrigerator with small sized butter packs,cream for coffee, juice. There was a pasta sauce and pasta available in case we wanted to cook; lavazza coffe maker, croissants. We loved our stay and will definitely rent it again, when we back in Rome! Thank you so much Tatyana! As my goal is to make my Guests feeling comfortable and happy to spend their Roman vacation at best! Great apartment, recommended for all! Great comfortable apartment in the middle of everything. 15 min to Vatican, 25 min to Roman Forum, 10 min to Piazza Navona. Perfect location on a quiet street next to some nice restaurants and cafes. Apartment is very modern with big (almost a queen) comfy bed, nice bathroom including a nice size shower. Bigger than your average Italian/European shower. Host was excellent as she greeted us on the arranged time, gave us all info on tourist attractions and bus info, and left us with snacks, coffee, toast and jams for breakfast. Could not have asked for a better host and apartment. Paola was excellent and I would recommend this apartment for anyone visiting Rome. Très agréable séjour dans ce mignonet et pratique studio. Il est très propre, calme, bien situé ! Accueil très chaleureux et éfficace par Flaviana. Charming Studio dans un quartier unique: à mi-chemin entre the Piazza Navona et Castel Sant'Angelo, tout près de la Via dei Coronari: celebre the rue des Antiquaires! Par le pont piétonnier St. Angel, traversé the Tibre arrivez facilement et vous à la Place Saint-Pierre, Vatican. Sur la même fleuve on peut faire un tour en bateau: une expérience formidable! POLITICA DI CANCELLAZIONE/ CANCELLATION POLICY Per un rimborso totale le cancellazioni devono essere effettuate 7 giorni prima del check-in prima dell'orario di arrivo locale. Se l'ospite annulla meno di 7 giorni prima del giorno d'arrivo, la prima notte non è rimborsabile ma le notti che seguono saranno rimborsate al 50%. Se l'ospite arriva e decide di partire prima dell'giorno di check-out concordato, le notti non sfruttate 24 ore dopo l'annullamento verranno rimborsate al 50%. For a full refund cancellations must be made 7 days prior to check-in arrival local. If the guest cancels less than 7 days before the day of arrival, the first night is non-refundable but the nights that follow will be reimbursed at 50%. If the guest arrives and decides to leave before the day of check-out agreed nights untapped 24 hours after the cancellation will be redeemed at 50%. Pour un plein remboursement l’annulation doit être faite 7 jours avant le check-in arrivée locale. Si le client annule moins de 7 jours avant la date d'arrivée, la première nuit n’est pas remboursable mais les nuits qui suivent seront remboursés à 50%. Si le client arrive et décide de partir avant le jour de check-out, les nuits convenues inexploitée 24 heures après l'annulation seront remboursés à 50%.